Can you believe that they have the school supplies out already in the stores?! 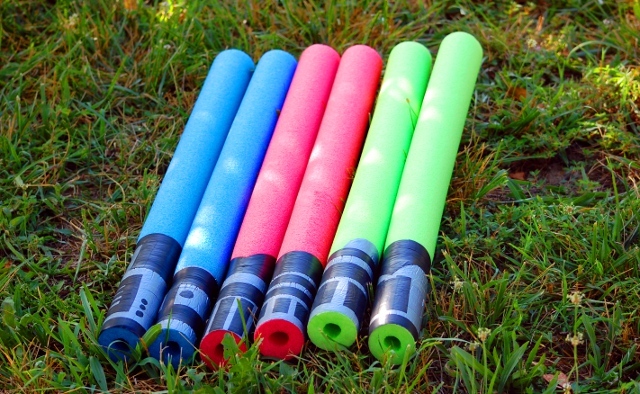 I found these light sabers made from pool noodles months ago via Pinterest. I’ve been meaning to make them, but when I went in the store and saw that the pool noodles had been moved to make room for glue sticks and scissors, I knew it was time to do it or wait till next year. Unlike the above tutorial, I did not seal the bottom of the sabers because my children just LOVE to stick things into other things and I figured it would be easier to get it out if they were open at both ends. The kids don’t care, though. They think they’re awesome. I did use a light saber chart to get some ideas for different handle designs, and now the boys can tell you which one of their pool noodles is Yoda’s or Darth Vader’s (we have two different Obi-Wan Kenobi sabers). 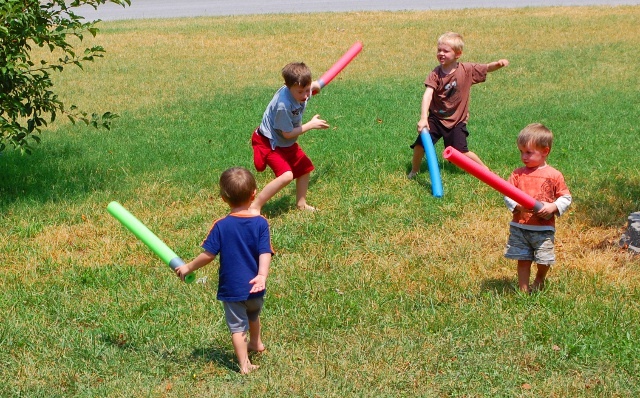 They wanted me to make Darth Maul’s double-bladed red one, but when we got the pool noodles home the first thing they did was start poking at our (vaulted) ceiling, so I thought it was best to chop them in half as quickly as possible. They had so much fun. I even dug out our video camera (which we rarely use, finding all the cords was a picnic, let me tell you) and we made a very dramatic movie which you absolutely have to watch, because it cracks me up. This entry was posted in Make it in Minutes, Other Projects. Ha ha! Love it! gotta say I enjoyed the twins stockpiling them and crying…reminds me of something Moochie would do! LOL!